During Thanksgiving, stores such as Best Buy and Target had amazing deals lined up for the next day, Black Friday. The deals were so impressive that people lined up at all hours of the night, bringing tents and gadgets to keep them safe and busy for the wait. The day is a very profitable event. While I’m sure many retailers lose some cash selling some items at a loss, they make up for it when customers purchase more items, accessories or upgrades. The day is such a success that approximately six years ago, online retailers wanted a slice of the action. In order to keep up with the sales rush, online retailers such as Amazon, had to plan something. What is their version of Black Friday? Well, Cyber Monday of course. Today marks the sixth year discounts are offered across the World Wide Web. In the United States alone, Cyber Monday sales topped $1 billion in 2010. To put things in perspective, consumer electronic, jewelry and even food and beverage retailers saw over 80% increases in sales for that day. With sales like that, the online event will continue for many years to come. 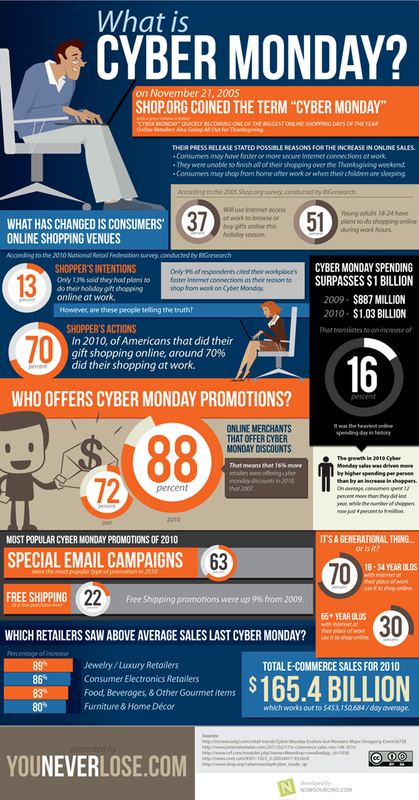 Nowsourcing has released a few statistics of Cyber Monday’s history and it’s worth checking out. The trend is definitely increasing. In 2010, 72% of online retailers participated in the event while 88% participated last year. The total e-commerce sales for last year were $165.4 Billion. That works out to almost half a billion dollars a day! Customers may be completing their shopping list for items not purchased during the Thanksgiving weekend. I’ve done the Black Friday dance. It was when I was still a teenager and the only time I attended the madness. I woke up early and headed to a local electronic store giant, not for the sales or new gadgets, but because I worked there. Let me tell you. Scarred. For. Life. I’m a happy Cyber Monday shopper now that it’s a big deal online. Over the years my Christmas shopping is done on the web more and more.